I’m not an SEO expert. I’m a direct response copywriter and content creator so SEO is best left to people who don’t have the intellectual ability to produce money-sucking copy(!). So I don’t spend vast amounts of time worrying about search engine algorithms. Google just made a big change to their algorithm through its Penguin Update. The search engines wage a constant war with ‘black hat’ SEO practitioners. The search engines want to maintain the quality of their search results. The so-called ‘black hat bad guys’ want to use dodgy tactics to rig the search results. There’s nothing illegal about the tactics of the bad guys. Companies like Google call them bad guys because Google sets the rules. But I don’t want to get into the whole ‘white hat’ and ‘black hat’ thing. If you know nothing about SEO, the Penguin Update especially penalizes SEO practitioners who essentially produce nonsensical website content—content ‘written’ to improve SEO results; the content is often directly plagiarized from other sites. Here’s an article from The Wall Street Journal explaining the impact. Content is king. Make sure your website has original and accurate information. Google places the greatest value on sites providing the best possible user experience. Use social media. Post links to content on your site from Twitter, Facebook and other social-media profiles. Your fans may repost the information. Spread your wings. Don't rely just on Google. Look for other ways to attract people to your website, such as by running special promotions or buying ads. If you rely on ‘black hat’ SEO techniques, Google is going to penalize you. You’re better off spending money on content and copywriting. Content to keep your visitors engaged and coming back to your website and social media outlets. Copywriting to persuade people to visit your website for the first time. And copywriting will also persuade people to take the next step in the sales process once they're on your site. Make sure your website has original and accurate information. Google places the greatest value on sites providing the best possible user experience. Again—I’m not an SEO expert but I believe EVERY search engine expert will tell you to pay close attention to superb and fresh content. Content will ALWAYS help your search engine results...and keep your prospects and customers engaged. I’ve been working with an excellent SEO company. They get superb ‘white hat’ results for their clients. But there’s a problem. The companies they help aren’t getting results—phone calls, emails, opt-ins, etc. That’s where conversion comes in…turning the visitors into buyers. If you want to do this, I’ve got the following advice. Use proven conversion techniques for landing pages. DON’T reinvent the wheel. Hire a direct response copywriter and use direct response copywriting techniques. We spend all day every day persuading people to BUY. Again—I’m not an SEO expert. I’m much more important! But seriously…when you focus on content and proven conversion techniques, your digital marketing will thrive. Just make sure you hire top-quality talent. Copywriter on Content. Part 3. Problem Solving? Or Entertainment? I often hear from potential clients: "Can you write B2B copy?" The answer is "Yes. 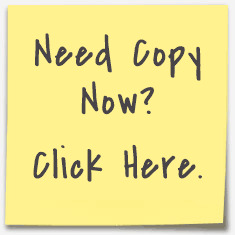 I write B2B copy." The answer is also, "In direct response, there's not much difference between B2B and B2C." However, there can be a slight difference when it comes to content. In B2B, companies are often solving a problem. "My air conditioning costs have skyrocketed." In B2C, the product might be a luxury--providing fun. A cruise ship vacation. Content for problem solving companies needs to be educational and informational. Case studies work especially well. If you want to see a website with superb case studies, go here. Testimonials are fine, but case studies are exponentially better. If you're in a problem solving business, crank up your case studies immediately. I like to ski and I used to climb mountains. Aspen Skiing Company has four blogs and they're all good but one is particularly excellent. A local skier writes it and it's superbly entertaining. Take a look here. This blog alone makes me want to visit Aspen for skiing. The author has an attitude and the attitude is "I'm here and you're not. You SHOULD be here." The content makes me want to get in my car and drive the 1700 miles from my front door to the gondola at the base of Aspen Mountain. Part of me would like to spend every day in the mountains. Ted Mahon, one of America's most accomplished mountaineers, writes a blog and while Ted isn't trying to sell anything, it's another great example of excellent content. Ted takes the trip of a lifetime every weekend and I'm always along for the ride. If you're selling entertainment or a luxury, organize your content around selling happiness. If you're in the problem solving business, organize your content around how you solve problems and how good you are at solving the problems you solve--using proof in the form of case studies. In the next content blog, I'm going to detail how to put together case studies and in part 5 of this blog series, I'll show you how to sell happiness through content.